Microsofts Edge browser, the replacement for Internet Explorer on Windows 10, continues to struggle to retain users, according to multiple metrics sources. 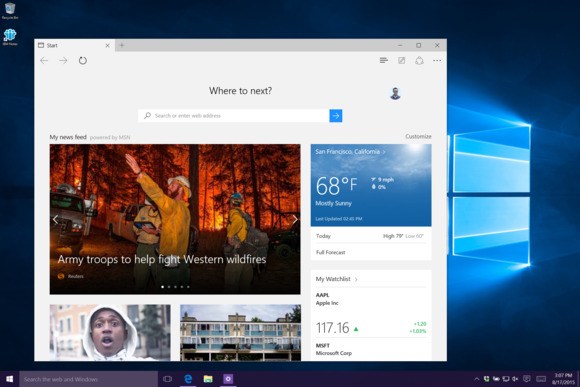 Since Edge debuted in late July, Microsoft''s latest browser has shed share each month. Data from three sources showed the decline both globally and in the U.S.; in the latter, the browser -- and Windows 10 -- have attracted a larger percentage of users than overseas' markets. The numbers for each source differ -- largely because of their varying methodologies -- but all illustrate the same downward trend. U.S.-based Net Applications, which measures global user share by tallying unique visitors to its clients' websites, pegged Edge's share of Windows 10 as 39% in August, then declining each of the next three months, ending at 31.2% in November. Meanwhile, Irish analytics company StatCounter tagged Edge's worldwide share of Windows 10 at much lower to start -- 15.2% for August -- but like Net Applications' numbers, its figures also showed a steady erosion. For the three months following August, StatCounter's data put Edge at 13.9%, 13.3%, and for November, 12.9%. StatCounter tracks usage share by counting page views for the websites that use its analytics package, making its measurements a proxy for browsing activity, not the fraction of users running a specific browser. The bulk of DAP's visits come from U.S. residents, although some agencies -- USCIS is one example -- record significant traffic from people who live elsewhere. And unlike Net Applications' and StatCounter's numbers stated above, DAP's includes a mix of both desktop and mobile devices. In the last 90 days, for instance, about a third of its visits originated from smartphones and tablets. Edge-powered visits to DAP's sites accounted for 24.6% of those running Windows 10 in September, the oldest month for which Computerworld has data. But Edge's percentage slipped each of the next two months, to 23.2% in October and again, to 22.4%, in November. StatCounter also offers data for the U.S.-only; those numbers were nearer DAP's than StatCounter's global measurements, but still lower than the project's. In the September-November span, StatCounter tapped Edge's share of Windows 10 at 18.1% in September and 17.7% in November. While each of the three sources posted different share figures, the rate of decline from September to November -- the period for which Computerworld had data from the trio -- was closer. According to Net Applications, Edge user share contracted by 14% during that stretch; StatCounter and DAP booked fall-offs of 7% and 9%, respectively. The lackluster adoption of Edge by Windows 10 users continues to surprise: Not only is Edge the default browser for Windows 10, but it has also been heavily promoted by Microsoft, which will swap in Edge for rival browsers during an upgrade from Windows 7 or Windows 8.1 unless the user intervenes. Speculation about Edge's low uptake has focused on its unfinished status, especially its omission of support for add-ons. Earlier this year, Microsoft promised to provide that support in 2015. But in October, the Redmond, Wash. company confirmed that add-ons -- also called "extensions" -- won't appear until some time next year. Three different analytics sources report that Microsoft's Edge -- the default browser in Windows 10 -- has shed share over each of the last three months.